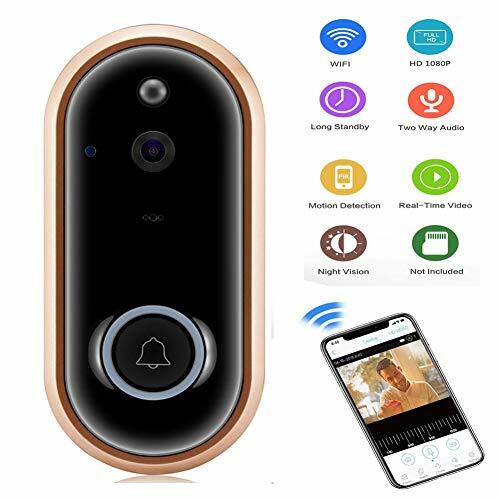 - ✅[1080P Real-time Two-way Talk Without Noise]-See, hear and speak to anyone at your door with clear 1080P full HD definition in 166°wide-angle lens through the APP which is compatible with iOS, Android. Feel free to use this smart doorbell to monitor your home security. - ✅[Two-Way Audio with Noise Cancelling] - Allows you to talk to your visitors wherever you are. And you can watch real-time videos on cell phone. Smart PIR motion detection and Loop Recording - Whenever any motion is detected, camera sends alert to your mobile phone, the sensitive time is adjustable. It also automatically covers the expired video files, easy to manage the monitoring records. - ✅[IR Night Vision]-Equipped with IR sensor and LED, day or night, rain or shine, the camera can automatically switch the light to ensure you a crystal view. Night Vision - Protect your home day and night with infrared night vision. Keep your home safe at night. - ✅[Wireless Remote]-Wireless Doorbell: No wires or cables are required. Just mount, download the APP (ToSee), then sync it to your doorbell. Access 1080P HD live video Day or Night,at any time from your cellphone. - ✅[Lower Power and Ultra Long Standby Time]- Adopt ultra low power technology. In this mode, the smart doorbell working time is more than 6 months,BATTERY NOT INCLUDE, Need 2 x 18650 batteries .